HomeResultsLondon Calling – Hot, Heroic & even Historic! London Calling – Hot, Heroic & even Historic! 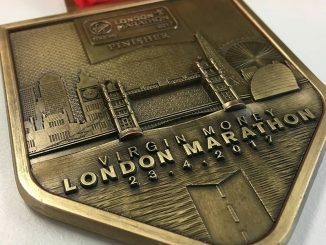 20 BRC runners competed in the hottest London Marathon of all time this weekend, having trained throughout the winter months they took to the streets of London in temperatures exceeding 24 degrees. With even the elite athletes struggling in some cases, we had PB’s, sub 3 hours times, 1st timers, mad multiple marathoners and even a Guinness world record! First across the line for Benfleet was Lee Baynton in 2.42.42 a PB of just under 2 minutes and a fantastic position 212 out of over 40,000 starters, next was Andy Low in 2.48.07 in 350 place and 26th in his age category followed up by Chris Wayman the 3rd of our runners to complete in under 3 hours in 2.52.30. Finishing in sub 3.30 were the following Nick Rankin 3.03.23, Adam Matthews 3.12.25, Peter Stalley 3.12.57 , Dan Carter 3.13.33 (3rd marathon of 7 in 6 weeks) & James Caldon (More later!) in 3.28.48. 1st of the Benfleet women to cross the line was Shelley Hall still breaking 4 hours in what she describes as the toughest race of her life in 3.59.53, next running for Havens was Georgia Bath in 4.45.26 followed by Susan Billington in 4.58.32. Sean Allison (3rd of 3 marathons in 3 weeks) finished in 4.42.50, Kevin Judge 4.56.19, Paul Daly 5.07.20, Sussana Hunt 5.53.58, an injured Mandy Cooper in 6.37.55 and Lee Allen in 6.42.15. 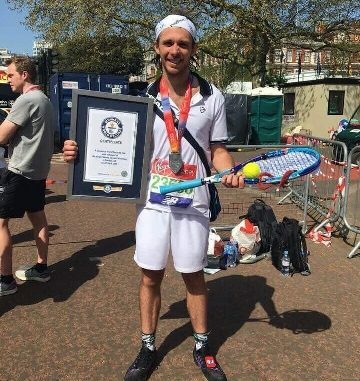 As many of you are aware we also had a club member attempting a world record, James Caldon who is a qualified tennis coach attempted to beat the world record running his 6 London marathon this time dressed as a tennis player with full kit including racket and balls. The record previously set at 3.44 was smashed by James who finished in 3.28.48. We should also mention all our marshals and supporters on the day who I am sure our runners would want me to extend their thanks to for their cheers and encouragement around the course and on our official marshal point. Well Done London Marathon Finishers!